Games Workshop apparently owns "Science Fiction". 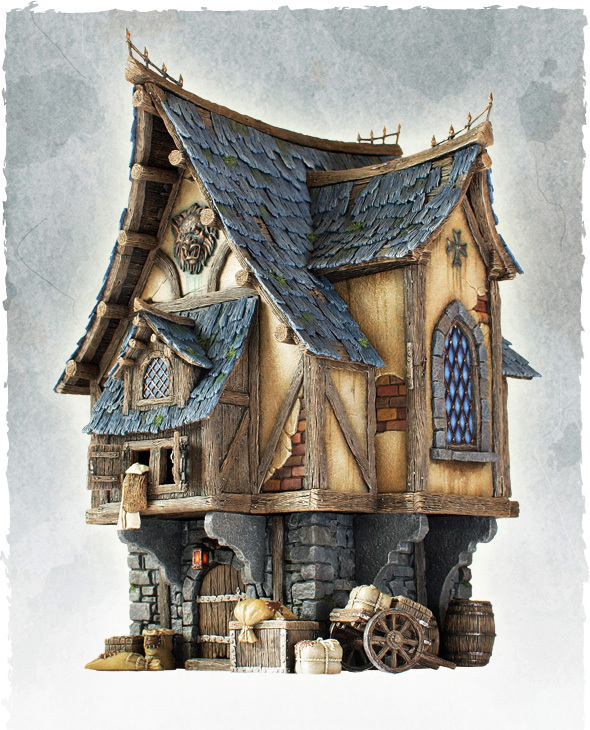 On a more positive note, I love the resin buildings from Tabletop World A couple guys in Croatia with a passion for awesome miniature scenery in that Bavarian old world style that's become a common sight in the genre. I don't own any of their building's, while not completely prohibitively expensive, the building in question runs $105 dollars shipped. Things like this are a slippery slope and this one of those things where you buy one, you will surely be buying more so before I got on that roller coaster I signed off on limiting myself to using them as my muse if you will. This merchant house below was my Inspiration for my merchant house pictured here. So outside of pennies in plaster and $20 for a new pack of plastic card for the roof (I used about half) this piece cost practically nothing but my time and things already had. This is three section building with totally playable first and second level. the top level comes off and sits flat and the roof comes off..so if want use sans bottom structure as a forest cottage on another table it totally works. As is, Ist now the biggest structure in my little "town" which is made of old Armorcast building, CNC minature kits, GW kits and my own Hirst Arts stuff. This building is actually bigger than my "Inn". I plan building a new Inn, a huge Inn which is going sit on top of the Already constructed Tavern Board as its base...the buildings base is 16 X 18 so its a monster that will take very long time to construct..The upper section of this building uses 1/8 inch MDF and cereal box fitted with pieces from the Hirst Arts "wooden plank" mold. so this was an exercise in miniature carpentry as much as anything. experimenting with buildings like this tells me how long the huge Inn will take and how I want to design it. I've planned on doing another half dozen buildings and full castle wall with gate house and turreted buttresses (under slow construction) The town currently fills up a 4X4 table with a 1/4 of it being docks with rooms for two ships. Not quite complete the building has fully constructed interior and with the new "Inn series" of interior pieces from Hirst Arts..will furnish it nicely...I'll show off the inside when its done but that won't be for awhile yet, I've got Adepticon coming up most of this was built in the Christmas - New years window at the beginning of the year..I just finished it up during breaks drying periods while working on my Rohan team army. While certainly not as beautiful as its inspiration it will do quite nicely and fits my town well....I've got the Castle Walls and more Dungeon pieces under construction...all this stuff has been WIP going on 4 years now..so dont expect it will ever be "Done" it just keeps growing. right now its all on a 4X4 and 4X8 table put together, I dont think a pair of 4 X8's is out of the question when its all said and done. Anyway. That's my Merchant House inspired by Tabletop world. Built with Hirst Arts Molds 42,70,71,75, 701, 220. 1/8 inch MDF, Cereal Box Cardboard, Plastic card and some knitting plastic sheeting used for the windows..materials cost (other than molds) around $20...time, start to finish around 20 hours. When Elrond gives you the facepalm you know things have gone off the rails! Well the new The Hobbit releases from Games Workshop are to date, pretty hit and miss. 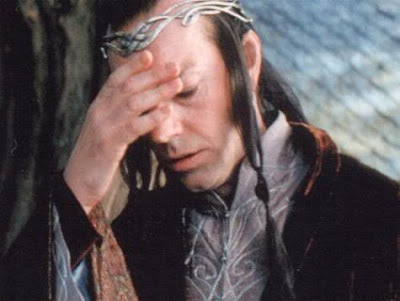 The game somehow survived limping along with a diehard fan base long enough to secure the new license for the new Hobbit films and we got some new Army books and a good new rule set in the last 2 years. The host of new models on the other hand and the starter set have been average to disappointing in my opinion. The killer sculpts of the Perry Brothers are sorely missed in conjunction with the inevitable lack of quality that is going to occur with going all plastic and what will, in the end be responsible for Games Workshop eventual demise if they dont change it, their Finecast line. I'm not sure what exactly is going on in the GW studio these days and who is even doing the sculpting as I cannot find credits given like they used to be. I am well aware they are limited creatively by the imagery of the films that New Line is providing, but it all just seems kind of half assed...while some of the new sculpts of classic characters are indeed great, much of the stuff is not. The new dwarves are entirely unappealing and "undwarf" like, No Azog figure, but some other guy we havent seen yet who kind of looks like him, wearing some armor straight out of Dune and then Blog looking like the main zombie from the "Cabin in the woods".Most disappointing are the new Men of Dale that I had such high hopes for, looking like an ostentatious line of Mongols or Huns instead of the tight Nordic looking men they should. Again this falls back on what the hell happened with Jackson production team. That got everything right for the first three films imagery and vibe wise and everything seems so wrong with "The Hobbit" as far its inclusion of anything new. Everything from the dwarves, the Sci fi- ish look of Erebor to Laketown looking like its doubling as set in the Game of Thrones TV series..(Pentos or whatnot) I dont know what the hell is going on there, bit obviously this is trickling down to the Games Workshop line. Adding insult to injury , all the best GW new models are done in flipping Finecast, other wise known as Failcast or Finecrap depending on your view point. Horribly overpriced resin thats often deformed, or miscast for 5 times the price of what could be a near flawless metal figure. Granted I am aware that finecast quality has improved but that doesnt change the price, the odds of still getting a bad one and do I really want to pay 20+ dollars for a single figure I have to worry about breaking, cleaning, blowing away indoors because its basically weightless...hell no. 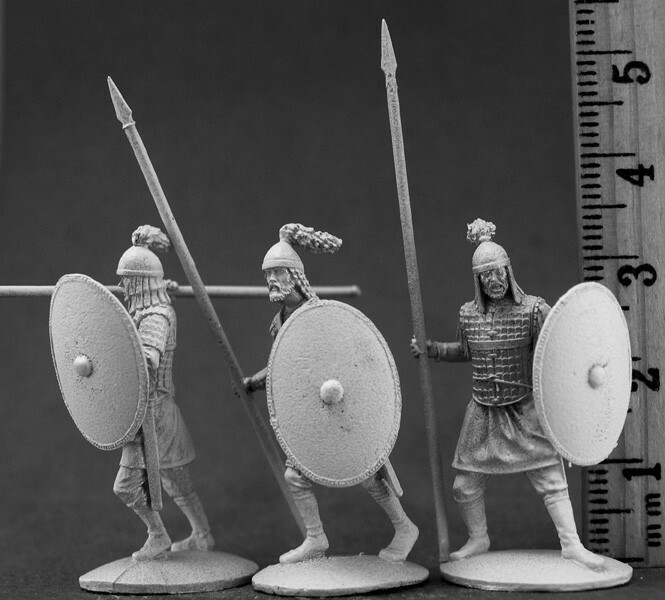 No sculpt is worth the grief of the worst idea Games Workshop ever had. 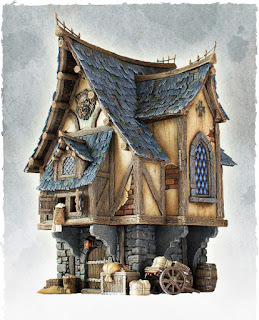 One of the many amazing Dioramas Mithril sells, this is collectors stuff and its not cheap, but unlike Games Workshop here it appears you do get what you pay for. Mithril sculpts and imagery are pre movies so there is alot of fantastic sculpts in a very classic sense and certainly things that would go brilliantly with your GW models if you choose correctly. Mithril has a huge line going back decades so you need to sort thru it all but I have found great stuff I am picking up I will show you soon. Figures are priced based on rarity or series over there, classic standard figs are around $6.50 a piece...again much cheaper than a standard hero model at GW in Finecast is $15..Mithril Aniversary series figs are around $27...but for that you get a killer metal figure that, get this.. is delivered factory cleaned and primed...all for slighty more than rolling the dice on the Finecast crap shoot. 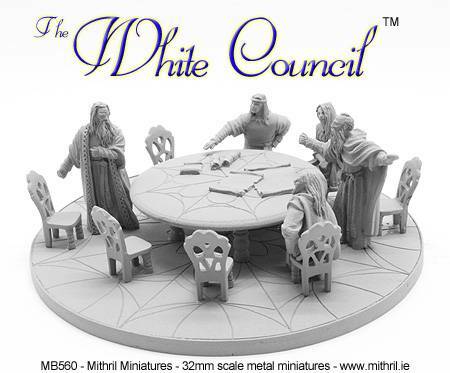 Mithril is a collectors line, I'm a collector, but most certainly we will see soon how they translate to gaming. Men of Dale?? Not a chance Attilla the Hun's elite guard...Sure! Second up is Tom Meier's Thunderbolt Mountain. Tom is a legend in the miniature sculpting business a was founder at Ral Partha back in the day. 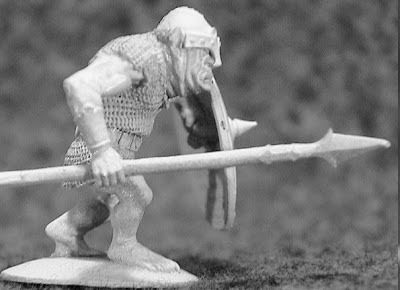 I have admired his Athurian line in true 25mm scale for sometime, but just recently I caught wind of his 30mm line of Elves, Men and Goblins and was blown away. The Tolkien motif is strong in these figures . The immediately struck me as timed with the current re popularity of Middle Earth. To me these figures look like jumped right out of book as I envisioned them as a boy. great prices too...I can by 10 crappy plastic Men of Dale from Games Workshop for $35 or 20 metal killer metal sculpts from Tom Meier for $50..its not even a contest. 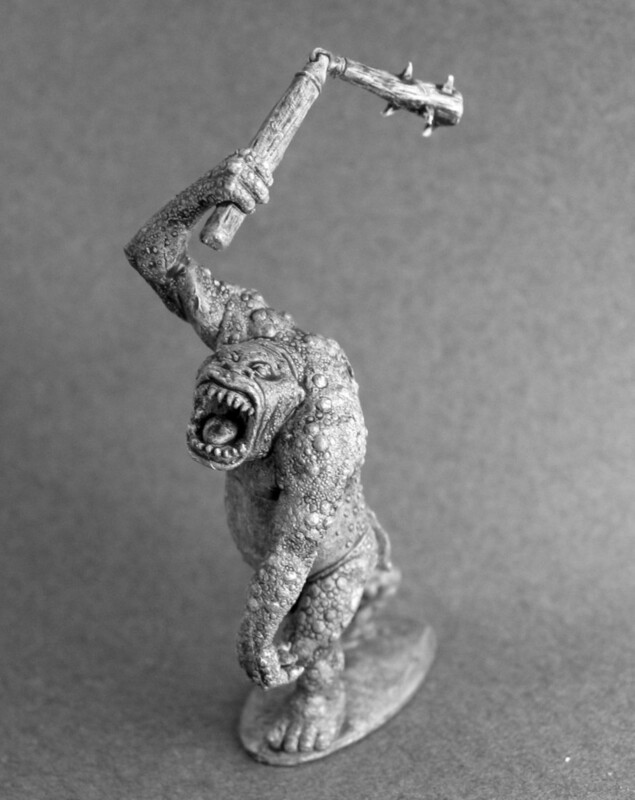 You want to do a Battle of the Five Armies game you want your Goblins to look like this! In closing, I'm glad to see some new horizons opening up for potential LotR gaming. 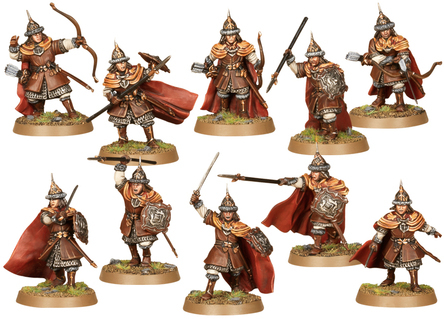 I still want to run my huge Battle of the 5 Armies games at some point...now I can see finding the proper figures to do in the style it should, I will get my Laketown Army, just not from Games Workshop. With Games Workshop shuttling all its Battle Bunkers in the USA 2013 (sans memphis?) and ties to tournament support will have sighed their last gasp. "GW only" model policy is going to be a thing of the past sooner than later in organized gaming, I for one am glad to see the hobby become "the hobby" without the brand ID being such a requirement. 5 of 8 Rounds are complete a couple of good games, has my Sparta dominating. My Spartans defeated Rome in somewhat close battle, that was somewhat misrepresent in the lopsided score Rome small but difficult units were giving me fits until things broke my way late games. My Victory allowed me secure all border territories ,I had been squabbling with take a Macedonian territory and finally after 3 rounds remove the remaining Syracuse Troops from Sparta In the East Byzantium and Syracuse had a close match with Syracuse prevailing. The Persians ambushed Macedonia with a huge win. Round 6 is this Tuesday. This caught my eye this morning, As my interests are moving away from large format wargaming to Skirmish gaming, this game caught my eye more than other Steampunk type games, due to the Horror/Holmes factor..growing up in the 70's the Hammer Films Productions horror films from the 1950's-1970's had a huge impact on me, This game seems to carry the vibe well, not to mention its inclusion of Sherlock Holmes, HG Wells, and what else I am seeing, this looks a cool game with great potential and these new Requiem figures look better than what I have seen of the previous era. Question is; I know some of you have played it, What is the game play like? can someone give me a rundown with their experience.? I been watching Kickstarter closely this last year, with much interest. Its new base as the pre order model for gaming manufactures is pretty interesting, its basically covering companies rear ends on new product lines by asking people to pre pay. They feel like they are getting deal thru extras / discounts and incentives, Companys are pulling in huge cash..The question is on the delivery. I have not read any horror stories yet about anyone not coming thru but I have notices delivery times are way off base from whats projected (based on my own KS experiences) I am somewhat waiting for the other shoe to drop where some major scandal erupts- but not yet its seems. Or at least they well if their legal team as anything to say about it. I was alerted to this by my blog roll this morning from Greyhawk Grognard, GG is an RPG blog so I wanted to point this out to miniatures hobbyists who dont have any cross reference. In the future, All Space Marines will be Warhammer 40K Space Marines. Is a blog post by writer M.C.A Hogarth who recently had his novel "Spots the Space Marine" pulled from Amazon for trademark infringement. Really GW?? 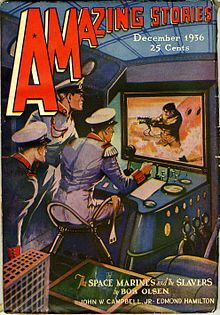 you own the term "Space Marine" a term being used in Science Fiction from as far back as the 1930's?. I'll save you treatise on it's literary use and needless to say the genre of "Science Fiction" owns this term. While true that if you play with toy soldiers and you hear the term Space Marine surely images of big blue robot like guys flying in space churches, fighting with chainsaws comes to mind, but when some one who has never heard of Games Workshop, (and yes there are many believe it or not) hears the term "Space Marine", they go uhhh.."Starship Troopers?, "The bad guys in Star Wars? let alone if you have any sort of literary Science Fiction pedigree. In short this is massive over reach by GW legal. We have seen this before. Once again an example of financial intimidation. This is a legal tactic often practiced that forces you to court (most often far from where you live) even thou you'll most likely win but because you cant afford the legal fees, you lose. Games Workshop has nasty habit of this despicable practice, and as we all know has a history of suing its fans, or anyone else in a gigantic net they throw out to look for IP infringement. something that wasn't lost on our friends at Battlefoam until they actually sued a guy that was a lawyer and could defend himself for free. This is not the case here, the author has no financial means to challenge this. It's been brought up in the comments this guy needs to crowd source fund his legal fees as this challenge will surely lose in court. So whether you're a GW fan boy or not, whether you buy and like their products or not do think this is ok? Can GW work its way to eventually buying "Science Fiction" if you're like me and love Science Fiction buy don't find GW Sci Fi universe particularly enjoyable, you wont let this slip by as this is the slippery of slippery slopes..not defending this type of challenges only re-inforces future GW legal actions. 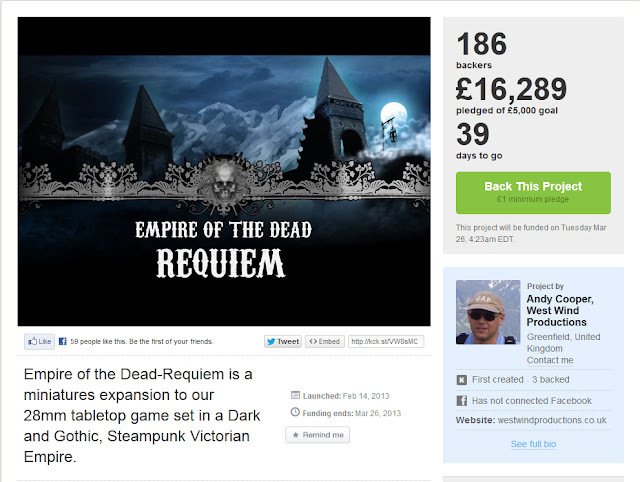 How much would you kick in to help this guy defend this challenge in a crowd sourcing effort? with all the dough I've thrown at Kickstarter and Indiegogo in the last year for toys for myself, I being embarrassed at anything less than $50.00, you?